Known as the friendliest tango festival in the world! Celebrating this year its 18 years of existence! A week of world-class workshops, immersion courses, shows and milongas. If you can't make the whole week, the main part of the festival is July 5 - 7. This is a fantastic tango festival with an amazing line-up of international tango teachers and performers. For a number of years Sophia has been participating in and supporting this festival (including as a guest teacher and performer for two of the festivals). She'll be there again in 2019, and most probably Pablito will too. If you register for this Festival and are associated with our school (as a student or friend) please list SoTango as your tango school when registering. NZ Tango Festival 2019 - Win a Free Pass! SoTango is very excited to announce that it is giving away a free pass to the NZ Tango Festival! This is a fantastic tango festival with an amazing line-up of international tango teachers and performers. For a number of years I've been participating in and supporting this festival (including as a guest teacher and performer for two of the festivals). I'll be there again in 2019, and most probably Pablito will too. Suitable for people with up to 6 months - 1 year experience. The 'Second Step Pass' includes a series of 6 workshops plus all festival shows and milongas and is valued at $275. Accomodation and travel is not included. All workshops and milongas on the pass occur between July 5 - 7 (the main part of the festival). There are immersion courses prior to and after those dates as well for anyone interested. For more details about the festival go here. This will be a wonderful and memorable opportunity to improve your tango at an event that draws tango students and aficionados from all over NZ, Australia and internationally. The second step dancer needs understand tango posture, walking technique, parallel system, know giro pattern, can lead and follow ocho easily, leading/following the cross usually works, can lead and follow simple combinations. Don't worry if you think you don't meet this criteria yet - there's still a number of months to prepare. What a great incentive to practice and develop your tango! This prize is exclusively for SoTango students. Anyone who has attended at least one lesson with SoTango over 2018 or 2019 prior to the draw will be eligible to enter. Entries close Sunday March 31. The prize draw will be drawn at our Practilonga in Bondi Junction on the same day, at 5pm. 1) Email to info@so-tango.com with the header " Prize Draw NZ Tango Festival 2019" and include your name and mobile number in the email. Feel free to contact Sophia if you have any questions about the festival. There's a lot of buzz around this Encuentro and now only a few spots left for leaders and couples. Wait list only for followers. Accomodation at Jamberoo Restort is also booking out fast. So don't delay! Unique, intimate and away from the hustle and bustle. 4 X 2 hour workshops with the internationally renowned Lorena Ermocida and Pancho Martinez Pey - direct from Buenos Aires! Lorena and Pancho await you at Jamberoo! Win a free pass to NZ Tango Festival! This is a fantastic tango festival with an amazing line-up of international tango teachers and performers. For a number of years I've been participating in and supporting this festival (including as a guest teacher and performer for two of the festivals). I'll be there again in 2018, and most probably Pablito will too. All workshops and milongas on the pass occur between July 6 - 8 (the main part of the festival). There are immersion courses prior to and after those dates as well for anyone interested. The immersion course by Amelia and Matthew is especially recommended. For more details about the festival go here. This prize is exclusively for SoTango students. Anyone who has attended at least one lesson with SoTango in 2017 or 2018 prior to the draw will be eligible to enter. Entries close Saturday March 17, 12pm The prize draw will be drawn at our Learner’s Milonga in Bondi Junction on the same day, at 5pm. 1) Email to info@so-tango.com with the header " Prize Draw NZ Tango Festival 2018" and include your name and mobile number in the email. "New Zealand Tango Festival was my first major Tango Festival and it was a great learning experience. My knowledge and understanding of social aspects of Tango grew immensely in just those 4 days. Attending workshops during the day and going to crowded Milongas at night, for me, was like being given a set of guidelines and then thrown in at the deep end. Fortunately, I came out better and cherish that experience to this day. Highly recommended!" Who's crossing the ditch for this? Who's going to the NZ Tango Festival? 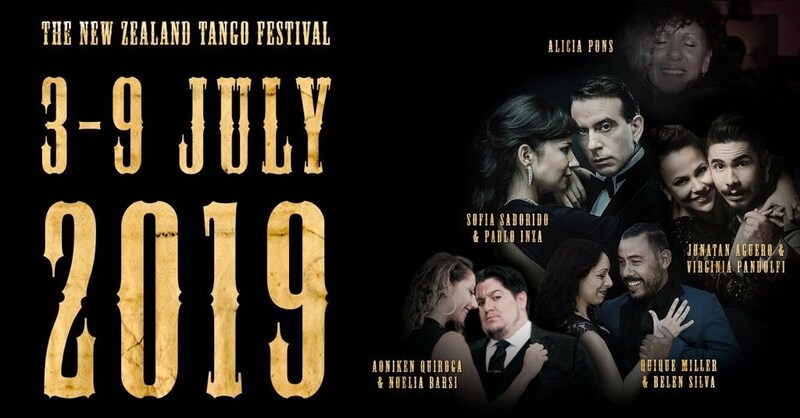 If you can make it to Wellington in late June / early July, seriously consider this festival which is known as 'the friendliest little tango (not so little these days) festival in the world.' I am so looking forward to it! What: A social tango weekend held in Bundanoon in the Southern Highlands of NSW. Registration will open on Tuesday 12 August. The picturesque Bundanoon is 90 minutes by car via the Hume Highway from Sydney or Canberra. BASH is organised by Tango Synergy and supported by Tango Social Club of Canberra. Includes: twenty three hours of social dancing. Music by six DJs from around Australia, tango band "Fuego Blanco" with Maggie Ferguson. There are various activities for you to choose, welcome drinks, cocktail hour with piano music and more. Anabella Diaz Hojman and Mario Consiglieri will be teaching and performing in Canberra, Melbourne and Brisbane from April 7 - 29. Canberra: April 7 to 15. You can find out more about Anabella and Mario on their website. Cecilia Gonzalez is back in Oz, by popular demand, from May 8 - 26! This fantastic festival is on my 'Must Do' list! There's an amazing line-up of guest artists! Sebastian Archaval and Roxana Suarez (former World Salon Tango champions), Michelle and Murat Erdemsel, Maria Plazola, Maria Ines Bogado and Sebastian Jiminez, David Palo and Anabela Brogioli. Click on NZ Tango Festival for more details. There is a special rate for the recommended hotel which is close to the workshop venues and the best place to mix and mingle with other out of towners. Be warned that the class sizes of immersion courses are limited and the hotel tend to book out early, so best to get in early. Special payment arrangement: To make things easier on the pocket when you register for your Festival Pass in February you only need to pay for the first half of the amount straight away with the rest not due until early May. Back in a previous incarnation (whilst running Patio de Tango) I hosted Ney's first trip to Oz and the workshops were incredibly popular, such that we invited him back a year later. On the second visit he was accompanied by his beautiful dance and life partner, Jennifer Bratt. Ney is a very charismatic and experienced teacher, and because he is so entertaining and knowledgeable what you learn in his workshops stays with you. His lessons are very memorable. That's one of Ney's special gifts as a teacher and I highly recommend him as a teacher. Ney will also be touring other parts of Oz and for more details visit the site of the tour organiser- Tango Butterfly. Thank you Dana of Tango Butterfly for bringing Ney back to Oz!